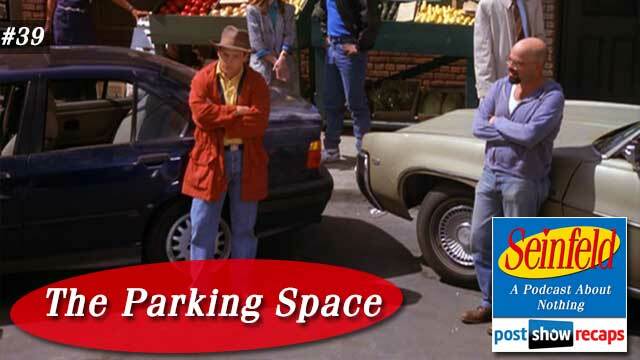 Rob Cesternino and Akiva Wienerkur continue their journey to watch every Seinfeld episode as they discuss Season 3, Episode 22, “The Parking Space”. A pack of wild teenagers chasing them down didn’t stop Rob Cesternino and Akiva Wienerkur from getting together to recap the next episode in the Seinfeld series. This week, they break down “The Parking Space”, which first aired April 22, 1992 as the penultimate episode of season three. It was written by Larry David and Greg Daniels. Daniels is a legendary comedy writer, most famous for The Office, Parks and Recreation, The Simpsons and Saturday Night Live. Akiva had a bit of news, some Seinfeld related and some not. First, he shared his disappointment in the passing of Harris Wittels, a podcaster, writer and comedian who was a part of some groundbreaking shows. Next he had a story about the defendant in the murder trial of the American Sniper who claimed an insanity defense that the prosecutor tried to prove was crafted from watching his favorite television shows, one being Seinfeld. Lastly, a viewer discovered that reruns of Seinfeld on TBS move 2.5% faster to add in more commercial time. The show opens with a classic Jerry bit comparing compact parking spaces to jeans that are too tight. The episode starts with Jerry and Kramer talking about where Jerry’s car is. Kramer can’t let it go when Jerry teases him about not telling him, actually begging Jerry to tell him. When he learns that George and Elaine took it to a flea market, Kramer is offended that he wasn’t invited. George and Elaine are driving Jerry’s car, with George wearing a new fedora hat he bought at the flea market. He and Elaine discuss how great it was in the 1920s when men wore hats all the time. Akiva felt that women today would probably prefer just to see a bald head, versus wondering if a hat is covering baldness. When Elaine moves the rearview mirror to look at her sunglasses, it distracts George, and he runs over a pothole, causing the car to now make a strange noise. Back at Jerry’s apartment, Kramer is still upset about being left out, and explains to Jerry that once someone crosses him, he’s like ice. We learn that Mike (Moffit according to Wikipedia) was coming over to watch a boxing match. Kramer shares that Mike thinks Jerry is a phony, which really bothers Jerry. Rob thought that Kramer shared this merely because he’s a big gossip, and that George should be considered more of a phony than Jerry. Elaine and George pull up to a great spot in front of Jerry’s building. He spends way too much time pontificating the art of parallel parking that someone noses into the parking spot at the same time as he starts to back in. When he gets out to argue, we see that the driver who went in head first is Mike Moffit. When Elaine goes up to tell Jerry what is going on, she acts flustered, asking for some Hennigans to calm her nerves. She makes up this elaborate story about being chased by teenagers all the way into the city, then at the end, tells him they hit a pothole and now there is a funny sound. So blown away from the story, Jerry pays no mind to the car hitting the pothole. Jerry, Elaine and Kramer join George and Mike down on the street, where neither is backing down from claiming the spot. When Mike sees Jerry, his greeting is way over the top. Rob pointed out that Mike was the real phony here. Elaine tells George that the plan worked, and Jerry isn’t worried about the car. Kramer confronts them about not inviting him to the flea market, to which George asks if he’s supposed to invite everyone he knows every time him goes somewhere. Mike interjects with a rude comment about George’s hat. Akiva said that Mike should definitely be in the top five “jerks” of Seinfeld sub characters. Jerry starts talking to Elaine and George about the wild teenagers, uncovering the holes in the story, to which George caves and tells the truth. As the debate about the parking spot continues unresolved, a big truck full of ice cream is trying to get through, causing neutral parties to have to move each car out, then back to their original spots after the truck gets through. Many onlookers, including Newman and Sid the parker weigh in with their opinions on who deserves the spot. Newman favors George’s approach, and in their discussion, notices George’s hat and wants to try it on. Because George is talking to a beautiful woman and doesn’t want her to see his bald head, he refuses. This turns the woman off, and she walks away. Not able to help himself, Jerry confronts Mike about calling him a phony. Mike tries to play it off by saying he meant phony as a positive, like how people say something good is “bad”. Realizing that the boxing match has started, Jerry runs up to the apartment, only to see that the fight has ended. Rob and Akiva assumed because the fight ended, Mike just went home, so George got the parking space. The episode ends with some Jerry standup about parking spaces. There wasn’t much that would change about the episode if it took place in 2015. Akiva felt this episode was harmless, yet it didn’t have any impact lines. He ranked it at 146 on his list, based on how much better other episodes in this stretch have been. There were a few listener emails this week. Gopal emailed for the first time, wanting to express how great the podcast is. Amir shared a story about being heckled at a Phillies game, embarrassing a homophobe who called them gay for wearing Mets gear. Amir also pointed out that the mother and son in the crowd this episode will be in “The Non-Fat Yogurt”. Johnny De Silveira wrote in to say that he would pull in head first. He also wondered if there is really free parking available in New York City, since there is none in the city of Vancouver. Akiva confirmed that there aren’t too many metered spots in the city. Lastly, Chester wanted to know why George would let Elaine come up with the lie, when she is admittedly bad at it, and his life is a lie. Akiva felt that because all of these people are such big liars, their lie detectors aren’t up to par. Rob felt that Elaine had little to do with the storyline, so it was written for her to concoct it. Tune in next week as the guys will recap the season three finale, “The Keys”, where Kramer will head to Los Angeles after Jerry takes his spare keys away due to abuse. Rob wanted the listeners to decide if they should do a “one-off” episode in between season three and four, or go right from one to the next. Email your suggestions on this and of course send in your questions by emailing [email protected]. Don’t forget to subscribe to the podcast by going to postshowrecaps.com/seinfeldITunes where you can rate and review the podcast. Follow them on twitter @robcesternino and @keev26.